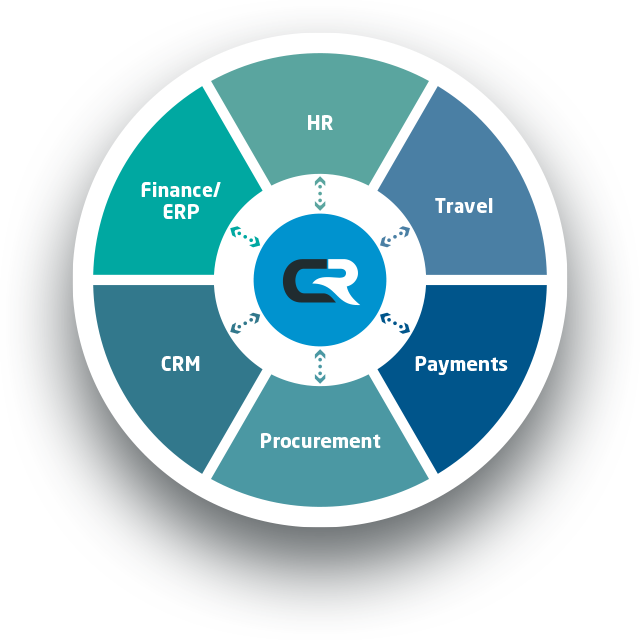 Chrome River offers a modern integration platform that gives you the flexibility to integrate a broad range of travel, financial and person data for you to let business flow with agility. We understand you want choice and flexibility in who you partner with to solve your business challenges. You require an expense and invoice management solution that supports choice and innovation when it comes to connecting the various systems you use. Our open platform empowers your business systems to seamlessly integrate with and leverage data from Chrome River. Connected systems give you the insight to make strategic business decisions based on data vs. instinct and dramatically reduces processing time required to manage data entry in multiple systems. Chrome River offers tried and true integration methods from secure file transfer to future-ready solutions leveraging REST APIs. Our new Chrome River Cloud Connector is an excellent example of innovation that offers the ability to connect Chrome River EXPENSE and INVOICE to any major ERP system in a seamless and automated manner. With minimal IT investment required, Chrome River makes connecting key systems you use every day easier by offering a pre-built integration process, a robust connector library, simplified data mapping, and automatic updates to ensure you have access to the latest features and functionality of Chrome River and your enterprise tools. Do you leverage SAP financial solutions as your system of record? Chrome River offers a certified integration that enables automatic updates of key financial data such as employees, entities, allocations, expense reports and customer payments using REST APIs for real time data exchange. This scalable integration works seamlessly with your global SAP systems including SAP ERP and SAP S/4HANA® (on premise and cloud). More information on this integration is also available within the SAP-Certified Solutions Directory. Visit our partner catalog for more information on the financial management providers with which we work like NetSuite ERP, Sage Intacct, Microsoft Dynamics GP an Oracle ERP Cloud. Travel managers are thrilled to know that Chrome River takes a fully agnostic approach to online booking tools and travel management providers. We support your choice to work with a local travel company, partner with a larger travel management provider like Amex Global Business Travel, Egencia, BCD, Deem, Carlson Wagonlit, FROSCH and Ultramar or use a travel booking tool such as Amadeus cytric, Sabre GetThere or Egencia. We also offer hotel and car folio integration to make expense report processing even easier. Users simply send their hotel or car rental receipts to Chrome River and we will analyze the receipt and convert the data by line item for easy drag and drop into your expense report. Learn more about our partnership with Traxo. Rideshare integration has never been easier. As a traveler, you have the ability to send ride information directly from your Uber, Lyft or Grab Business Profile to your expense report. Chrome River receives data from your business and personal credit cards securely so that your expenses are seamlessly created within your Chrome River wallet. With real-time alerts, statement reconciliation and more, managing your expenses has never been easier with Chrome River. Our data integrations support feeds for all card types, like Visa, Mastercard, Diners Club and American Express, whether transactions occur on a corporate card, ghost card, personal card or small business card. We work with a wide range of financial institutions, like U.S. Bank, Citibank, Barclays to integrate credit card statement data with real time alerts and more for enhanced integration. Visit our Chrome River Partner and Ecosystem page for more information. Our team of experts will partner with you to determine the integration strategy that best fits your business for the fastest time to value whether that be through secure file transfer or with near real-time APIs. As a customer of Chrome River, you will discover the true value of your ecosystem by gaining access to Chrome River’s partner integrations that will help you break down data silos, increase efficiencies, and gain visibility into your spend. Chrome River moves with you as you grow and change. Our open integration platform allows us to continue to partner with you should you decide to make a change in a third-party system provider. We value your business and look forward to partnering with you to let business flow with agility. We never lock down a list of approved vendors, and we never limit your growth or processes by forcing you to adapt to our system. Our system instead adapts to you and your needs. We partner with you for long term success.